The McCain family is mourning the loss of the beloved canine companion who was constantly by the side of Sen. John McCain in his final years. 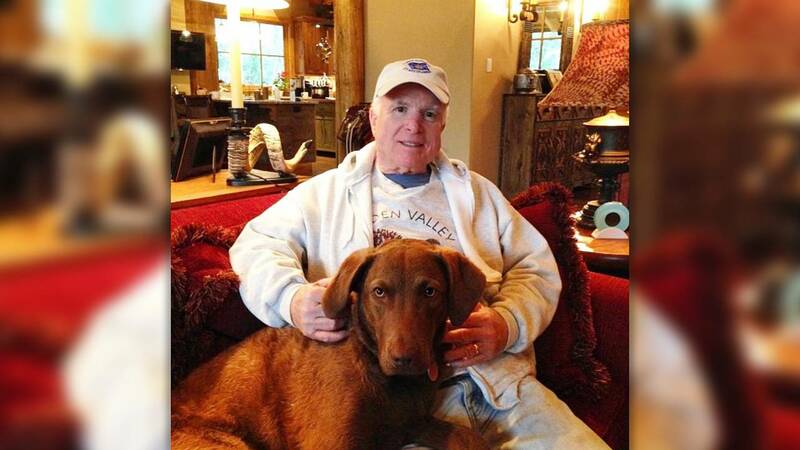 Cindy McCain, 64, revealed in an Instagram post on Monday that Burma, the Chesapeake Bay retriever who was given to her late husband as a birthday present years ago, died in a "tragic accident." McCain wrote that Burma died in an accident at the family's Hidden Valley Ranch in Arizona, about eight months after Sen. McCain died at 81 from brain cancer. "She now (sic) frolicking with the one she loved most in heaven now @senjohnmccain," she wrote about Burma. Meghan McCain, 34, also wrote an emotional Instagram message in memory of the dog that had formed a close bond with her father. "Every time I think my heart can't be broken any further...our dog Burma was my father's birthday present years ago and was absolutely and truly devoted to him,'' she wrote. "She would never leave his side, followed him around every single step when he would walk around our ranch, slept by his side every night and we always said Chesapeake Bay retrievers were the most affectionate breed of dogs." Sen. McCain was often pictured with Burma, including a shot with Cindy at Meghan's wedding in 2017. Burma also remained by McCain's side following his death. Cindy posted a poignant photo in February of the dog at a grave marker for her husband at the family's ranch. "The love this dog gave him was equal to a family member,'' Meghan continued in her Instagram post on Monday. "I love you Burma and hope you're in heaven jumping into creeks, chasing sticks and fish with Dad."